This is a brand new 2oz fine silver bar minted by renowned producer Royal Canadian Mint. This ingenious silver bar combines the best of all silver products into one offering. It forms part of the prestigious Maple Leaf series, following a rich history of gold and silver coins. The Canadian Mint has led the way with producing super high fineness gold and silver, with other Mints following suit. This silver bar attains the same high level of purity at 999.9 fineness. Each 2oz silver bar is split into 19 smaller denominated silver bars by way of perforation. The top row consists of 10 x 1/20oz silver bars, the middle row 4 x 1/4oz silver bars and the third row 5 x 1/10oz silver bars. 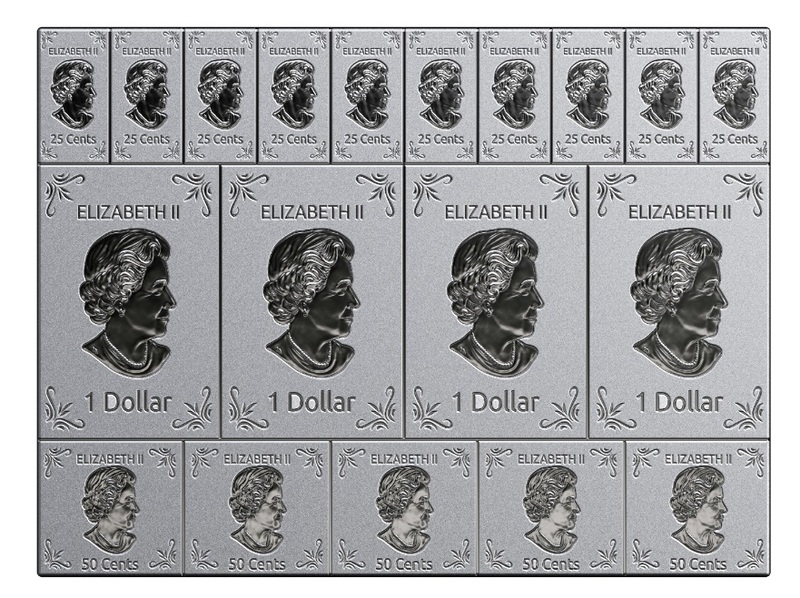 Each of these bars, just like silver Maple Leaf coins, features a face value. The smallest bars are 25 cents, the largest 1 Canadian Dollar, and the mid-sized at 50 cents. The design of the bars allows for easy storage and carrying when untouched but each bar can be snapped of into individually to provide small denominations when required. The front of each individual mini bar features the recognisable Canadian Mint depiction of Queen Elizabeth II, represented in a shiny finish on a matt background. Above the image sits confirmation of the monarch and below is the face value of each bar. The bar obverse is finished with a design flourish in each corner of each bar. 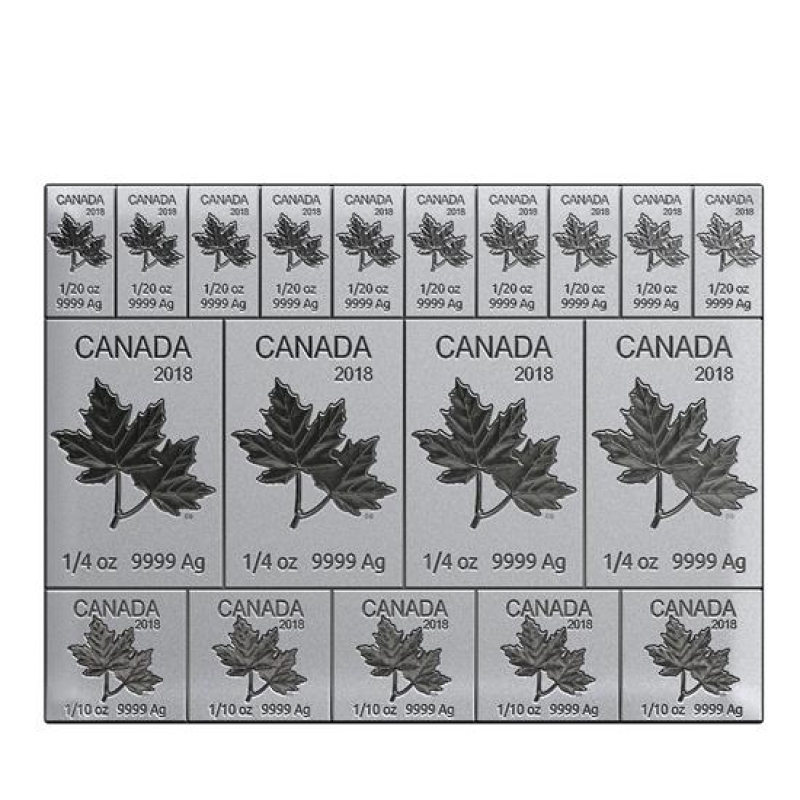 The reverse of each silver bar illustrates the world-famous Maple Leaf design with the engraving ‘CANADA’ and the year of production above. Below the Maple Leaf, sits confirmation of the bar weight, purity and metal. We absolutely love these silver bars. The finish and integrity are second to none, being produced by leading refiners. The design has been well thought through to enable ultimate flexibility and will appeal to those who feel Fiat currencies will collapse and owning small denomination silver bars will enable security and a payment method for goods.